There’s such great diversity in the plant world, but sometimes it can be overwhelming. For those that want to add a pop of color while also reaping the air cleansing benefits of an indoor plant, then Pothos or Epipremnum Aureum might be a great place to start. Pothos is the perfect plant for novice indoor gardeners. They are easy to grow and maintain while providing great visual impact. This trailing vine has heart-shaped leaves with white, yellow or green variegations. 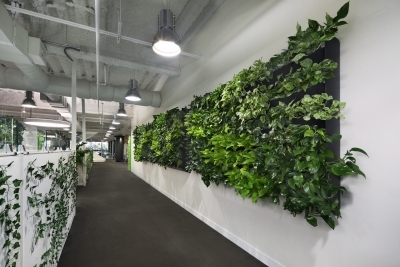 They grow well in direct or indirect light, which makes them great for an indoor office. They also purify the air, removing formaldehyde, trichloroethene, toluene, xylene and benzene from your environment. They also look great in living walls. So what do you need to do to grow and maintain pothos? Here are a few quick steps of success. Watering: Pothos will tell you when they need water by wilting slightly. Wait for the soil to dry out completely between waterings and then water deeply. You can also place a saucer underneath the pot so that the plant can draw up water as needed. Don’t wait too long to water though. If you see brown, dry leaves, you may have waited too long. Overwatering can lead to rot at the soil level, so keep that in mind. Fertilizing: Pothos don’t need much in the way of fertilizers, but a balanced fertilizer from a local nursery will help boost the nutrients in the potting soil. Pruning: Pothos is a vining plant, so pruning is essential. To keep Pothos full and dense, cut it back frequently. That will spur new growth to keep your plant looking fresh and healthy. 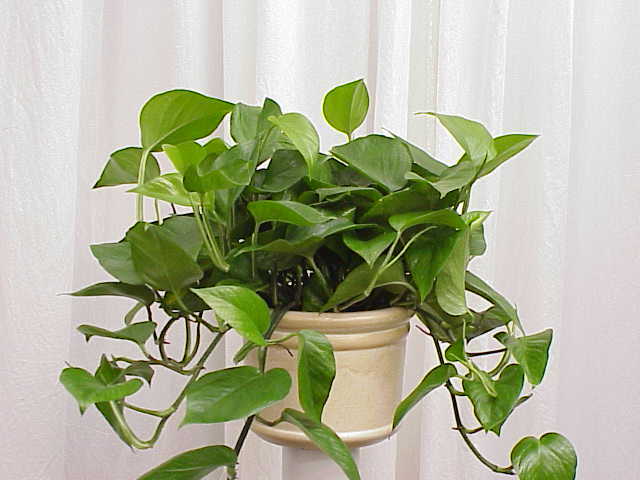 Environment: Pothos are tropical plants, native to Hawaii and other tropical regions. Unsurprisingly, they love humidity but can still thrive in drier conditions. They should be kept above 50F but love 65-75F. Risks: Pothos is poisonous to children and pets if ingested. The leaves contain calcium oxalate crystals, which can irritate the lips, mouth, and tongue. If your pet has chewed on the leaves, call the veterinarian immediately. Pothos is an excellent introduction to the world of indoor plants. Pick one up at your local nursery or ask about one from your local indoor plantscaping professional!